The El Salvador Flag is a striking symbol of the country's place in the world and its values. 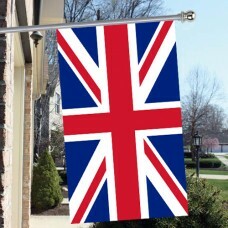 The flag is comprised of three horizontal bands of equal height. At the top and bottom are bands of cobalt blue. These represent the two seas between which El Salvador sits. The middle band is white, which represents peace. The country's coat of arms is printed centrally on the white band. Around the coat of arms are the words "Tierra de Volcanes Soberbios." This translates to "land of the superb volcanoes" in Spanish. This motto carries both a sense of El Salvador's physical geography and its colonial history. As a republic in Central America, it sits in a part of the world which has been fought over for hundreds of years, and is yet a land of stunning beauty. There are two versions of the El Salvador Flag. 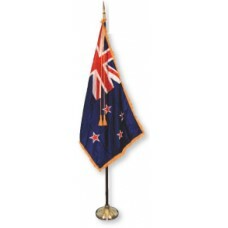 The first version bears the country's coat of arms and is used in the international community. The second version is flown within the country on public buildings and features the same three colored bands of cobalt blue and white, however, the printing on the white band reads, "Dios Union Libertad" in large bold amber letters. 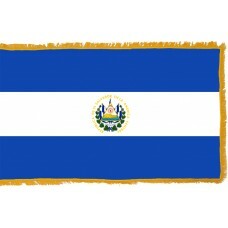 This striking version of the flag states boldly that El Salvador believes in God, unity and liberty. The country has a history dating back thousands of years, and its people are of native American ethnicities as well as European and African ancestries, which gives the nation a strong sense of diversity. The blue color of the country's flag is also chosen to symbolize the anil or indigo plants, a flowering variety of the pea family, which El Salvador is famous for. The anil's flowers can be crushed to make indigo blue dye, which became very valuable in the middle ages. The Spanish empire conquered what is now El Salvador and exploited its anil indigo dye by exporting to Europe, America and Asia. This trade in anil dye led to the products being nicknamed, "blue gold." It formed the basis of El Salvador's wealth, before being overtaken by coffee production. As with other parts of Central and South America, the country's hot, humid climate and friendly soil make it an ideal place to grow coffee beans. This and sugar cane are very important components of El Salvador's economy. El Salvador also has an extensive range of both active and inactive volcanoes. The country's capital city, San Salvador, sits at the foot of an active stratovolcano, which last erupted in 1917.